Ten years ago, Brian O’Doherty ‘buried hate’ on the grounds of IMMA when he laid his alter ego, Patrick Ireland, to rest in a semi-private wake and memorial service at the museum. Emer Lynch, Curatorial Assistant, Collections, IMMA reflects on the decade that has passed since The Burial of Patrick Ireland and the artist’s recent visit to IMMA where he was awarded the Freedom of Roscommon and officially opened the retrospective exhibition IMMA Collection: Brian O’Doherty Language and Space, now open at IMMA until 16 September 2018. 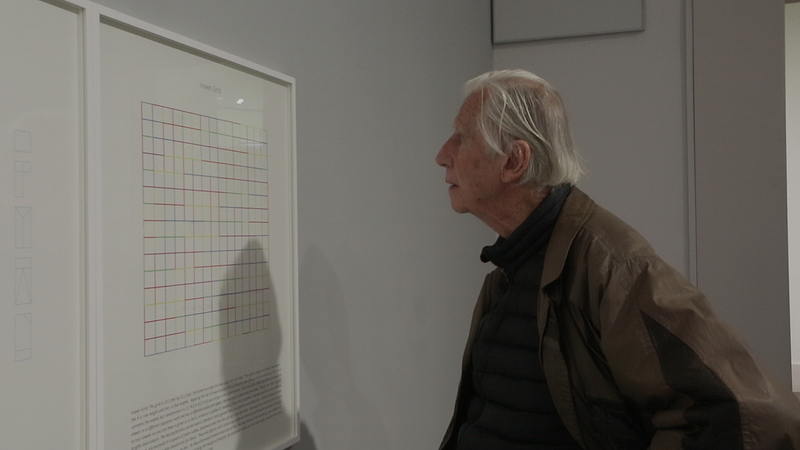 Brian O’Doherty viewing his Structural Plays series, produced in association with Stoney Road Press, during the launch of IMMA Collection: Brian O’Doherty Language and Space. warmth during the opening of his exhibition titled IMMA Collection: Brian O’Doherty Language and Space. The extended display in the East Wing Galleries includes works from IMMA’s National Collection, combined with prints produced by the artist with Stoney Road Press, Brian O’Doherty, resident in New York since 1957, returned to Ireland last month to see the unveiling of ONE HERE NOW, a unique restoration project of an Ogham-inspired cycle of murals at Sirius Arts Centre, Cobh led by director Miranda Driscoll. Indeed, the country celebrated the artist, who turned ninety on 4th May. 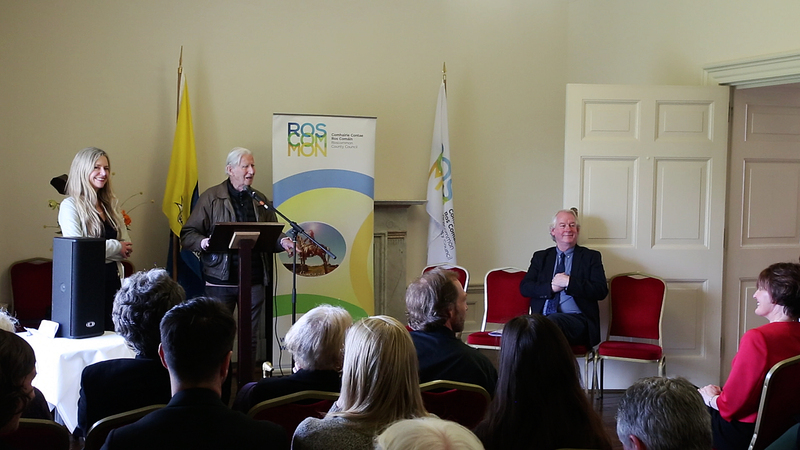 Brian has indefatigable energy and his extended visit to Ireland included attending further events in his honour at Crawford Art Gallery, Cork and the National Gallery of Ireland, Dublin. At the opening of Brian O’Doherty Language and Space at IMMA, the taxi carrying Brian and his wife, art historian and artist, Barbara Novak, made a detour to the museum’s formal gardens. Brian and Barbara, hand-in-hand, headed directly to the limestone headstone set in the grass that marks The Burial of Patrick Ireland. The story behind this unassuming resting place of Patrick Ireland really begins in 1972. After the Derry massacre that year, the artist Brian O’Doherty undertook to sign his artworks under the name Patrick Ireland, until the British military presence was removed from Northern Ireland and all citizens were granted their civil rights. 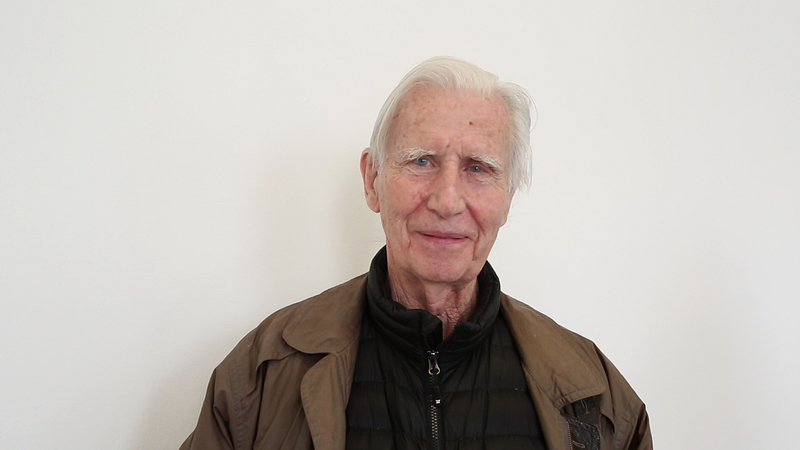 In 2008, these conditions fulfilled and ten years having passed since the Good Friday Agreement of 1998, Patrick Ireland’s existence was terminated through the performance The Burial of Patrick Ireland. The wake at IMMA was performed not only by the artist, but by official mourners including celebrant Michael Rush; pallbearers Robert Ballagh, Jeanette Doyle, Brian Duggan, Joe Stanley, Brendan Earley and Fergus Byrne; poetry read at the graveside by Anne Haverty for Anthony Cronin, Ingmar Lahnemann for Hans Belting, Anne-Marie Bonnet, Enrique Juncosa and Caoimhín Mac Giolla Léith; and music performed by Eoin Dillon, Steve Larkin, Seighean O’Draoi, Frank Tate and Graham Watson. Alanna O’Kelly’s presence as keener was spine-tingling on the deceptively bright but cold May afternoon. As an effigy of Patrick Ireland, placed inside the white coffin, was lowered into the grave, Brian O’Doherty proclaimed, “We are burying hate…in a ceremony of reconciliation celebrating peace in Northern Ireland”. 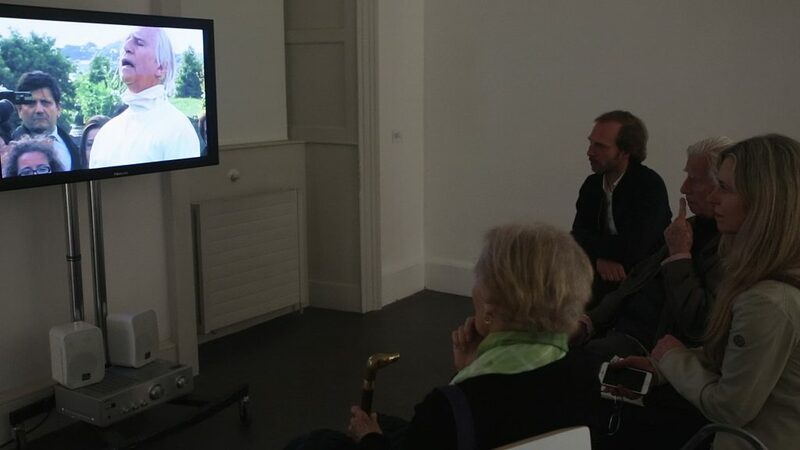 After IMMA’s exhibition launch last month, ten peaceful years after his symbolic performance, Brian O’Doherty viewed Sé Merry Doyle’s documentary Lament for Patrick Ireland in the gallery. It was a poignant moment shared with wife Barbara, friend Dr. Boris Hars-Tschachotin, IMMA’s Senior Curator: Head of Collections, Christina Kennedy, Curatorial Assistant Emer Lynch, IMMA’s Visitor Engagement Team and members of the public. 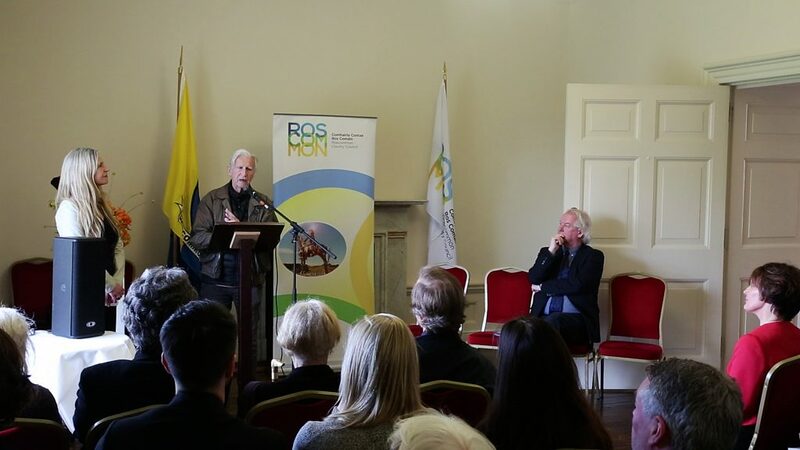 The event was a reminder of the gravity of the meaning of O’Doherty’s political performances, such as the creation of Patrick Ireland in the first instance, and Ireland’s journey to peace that thankfully rendered Patrick Ireland’s identity obsolete. In this video, Christina Kennedy (Senior Curator, IMMA) provides an in-depth look at a new rope drawing by Brian O'Doherty. Visual Art, Audiences & Ireland. 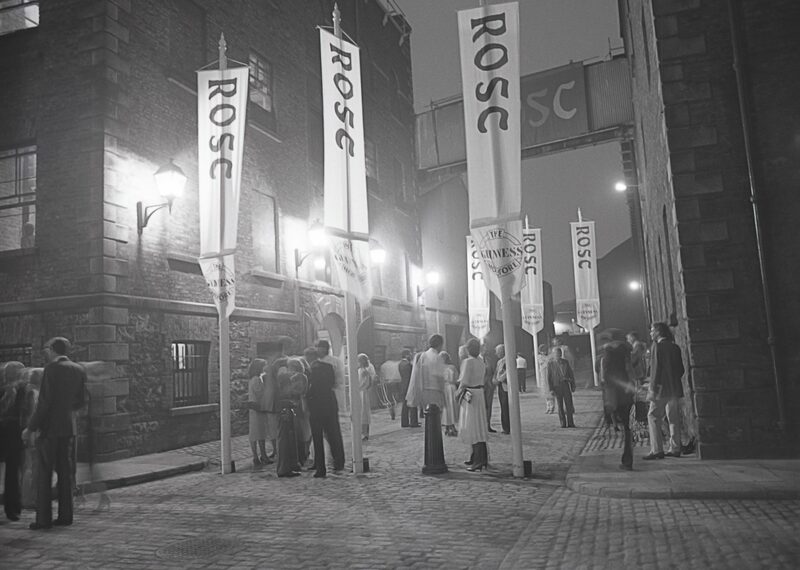 50 years on, what can we learn from Rosc? When the 50th anniversary of the first Rosc came onto the radar of the programming team at IMMA we sent a long time discussing what our response would be. IMMA, The Irish Museum of Modern Art, is pleased to announce highlights from our 2015 exhibition programme.